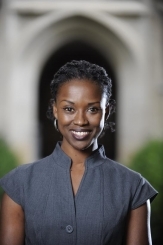 Jemima Pierre (Ph.D., University of Texas at Austin) is a sociocultural anthropologist whose research and teaching interests are located in the overlaps between African Studies and African Diaspora Studies and engage three broad areas: race, racial formation theory, and political economy; culture and the history of anthropological theory; and transnationalism, globalization, and diaspora. She is the author of The Predicament of Blackness: Postcolonial Ghana and the Politics of Race. She is currently completing a manuscript whose working title is “Racial Americanization: Conceptualizing African Immigrants in the U.S.,” and working on a project on the racialized political economy of multinational resource extraction in Ghana. Dr. Pierre’s essays on global racial formation, Ghana, immigration, and African diaspora theory and politics have appeared in a number of academic journals including, Cultural Anthropology, Feminist Review, Social Text, Identities, Cultural Dynamics, Transforming Anthropology, Journal of Haitian Studies, Latin American Perspective, American Anthropologist, and Philosophia Africana.